“The band only initially finished 12 tracks, and then finished Back to School over the summer making that 13 finished tracks for the White Pony sessions. If they had any leftover material, the band would have to go and finish it in the studio if they ever planned on releasing it. There’s nothing really in the can right now. There’s preliminary Team Sleep stuff being worked on and there’s talk about a remix album. The only other things they did recently in the studio was work on some acoustic renditions of White Pony songs. Change acoustic was the only one they finished, and it was pretty much following the original version of the song. They started working on acoustic renditions of Digital Bath, Boy’s Republic, and Knife Prty but didn’t complete these tracks yet. These tracks were much more in the way of RADICAL REWORKINGS of them. There is an unfinished version of the Boy’s Republic acoustic out there from those sessions, it remains unmixed, unfinished, and without vocals, and overdubs and whatever else the band needed to do to that song as well as Digital Bath and Knife Prty acoustic. Someone snuck a disc with that and the other unfinished tracks out of the studio and it was leaked by that way. Knife Prty and Digital Bath, did not get leaked however. One day these tracks may surface in a finished form as b-sides on singles, or if they have been reworked to the point that they would be deemed appropriate for inclusion on the proposed Black Stallion, then so be it. – Timbaland was the working title for none other than Passenger, that is a fact, straight from Stef’s mouth. – Nightrider, working title for something they had, I don’t think it was Digital Bath though even though early mp3’s of it were mislabeled as Nightrider. 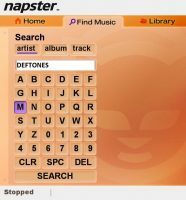 One last thing, in an early fan site review, i believe, the band said they had finished up 2 songs that were from Team Sleep and BOTH of them were going to turn up on White Pony. Now as we all know, only Teenager turned up on it. Some say that RX Queen may have originated from Team Sleep but the band has said otherwise saying it was something Chino and Abe made together halfway through the album’s sessions, as opposed to the various Team Sleep recording sessions the previous year. Knife Prty was actually “Knife Party at Niko’s”, not “Knife Party at the Niko”. I still have the files I downloaded back then.